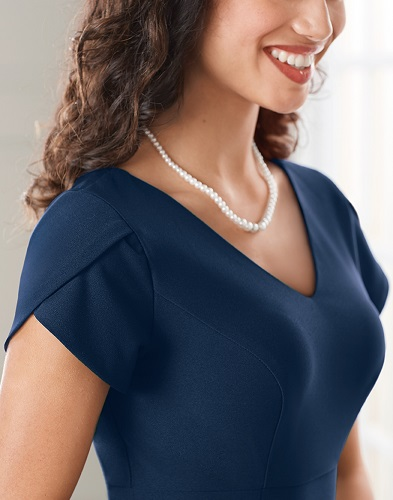 The Georgia dress is a fabulous option when you are looking for a V neck orchestra gown. The tulip sleeves give you the benefit of a cap sleeve without the restriction on your arms. Complete range of motion can be achieved. Modesty is a concern as well, so the V neckline in the front is shallow and the back neck line comes up to the neck bone. We know that you have to travel sometimes for performances. Because of this, we created this formal gown in our washable, wrinkle resistant polyester crepe. FWO Extra: Even though polyester crepe is considered a self-lining fabric, meaning that the dress is not made with a lining, we recommend you wear a full slip for extra modesty.